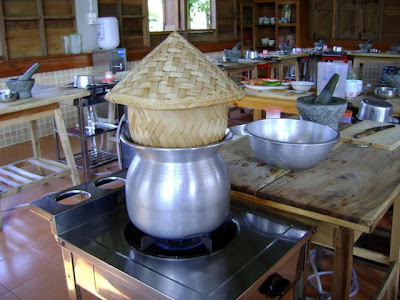 Sticky rice steamer is a Lao cooking school. The traditional rice serving basket is called a gateep. A double boiler used as a steamer for sticky rice. Each morning as roosters greet first light, the sun begins to arc and the hazy rice paddies of Luang Prabang become tinged in pink and gold. This city wakens gently. Rice pots are set to steam and soon after temple drums begin a rhythmic signal that marks the beginning of a ritual as old as the Buddha himself. 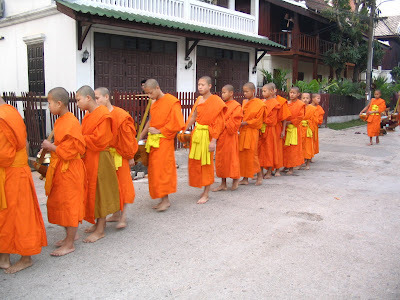 The morning alms procession (Tak Bat) is a living Buddhist tradition that has great meaning for the people of Luang Prabang. Monks file out of monasteries in lines that resemble threads of saffron swaying in the breeze. Townsfolk take their places on the side of the road, rice baskets in hand, to repeat, yet again, the ancient custom of giving alms. The men stand, shoulders covered in white scarfs. 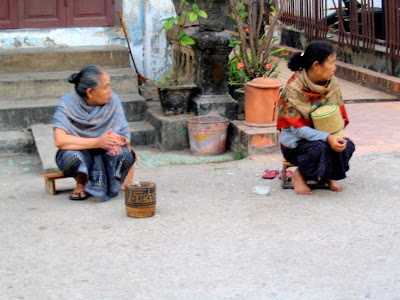 The women sit on stools or kneel. No one wears shoes. This is a silent procession; the stillness is broken only by strutting, crowing roosters and the scuffing of feet on hammered earth. 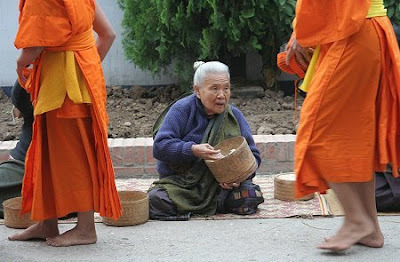 The alms basket of each monk receives a ball of sticky rice from the right hand of every person along the route. Only the right hand may be used. The monks receive sustenance. The townspeople gain merit which they believe will bring them happiness, a peaceful life and strength to overcome any obstacles or misfortune that they might encounter. And what did I, an outsider, receive? I was strangely moved by the piety of givers and receivers and the nearly perfect silence of the procession; for a few precious moments my world stood still and I was suspended in time in a place that could be called Shangri-La. In northern Thailand and Laos, sticky rice is served at every meal, much like bread in Europe ot the United States. 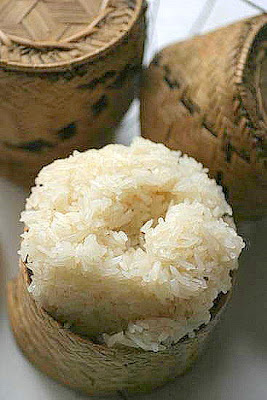 The rice is soaked, then steamed and traditionally served in a wicker basket called a gateep. Diners, using their right hand, scoop a couple of tablespoons of rice at a time into a small ball, then use it to pick up a chunk of meat or vegetable, or to soak up sauces. It can be served hot, warm or at room temperature. 1) Cover rice with 2 to 3 inches cold water in a large bowl and soak at room temperature for at least 3 or as long as 12 hours. 2) Place a steamer basket or a footed colander over the base of a steamer containing about 4 inches of water. 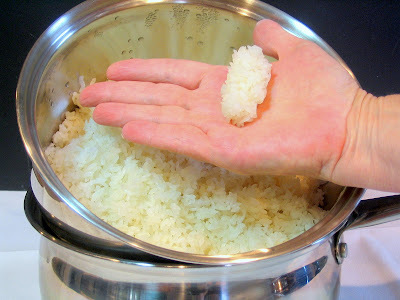 Rinse rice until water runs clear; drain, place in steamer basket, and steam, covered, over boiling water until shiny and tender, about 20 minutes. Remove from heat. Let sit, covered, for 5 minutes. Gather rice into a mound and transfer to a serving dish or a gateep (a coverered serving basket). Yield: 4 servings. Cook's and Traveler's Note: Many cultures still prefer to eat using traditional methods — their hands. In these cases, food is often offered communally, which is why it’s important to wash your hands before eating and observe the right-hand-is-for-eating and the left-hand-is-for-other-duties rule. If you eat with your left hand, expect your fellow diners to be mortified. And when partaking from a communal bowl, stick to a portion that’s closest to you. Do not get greedy and plunge your hand into the center. If you are left-handed, attempt to be ambidextrous — even children who are left-handed in these cultures are taught to eat with their right hand — or at least explain yourself to your fellow diners before plunging in. Your words are so perfect with the photos. Thank you Mary. Tanna, I wish everyone could see this magical place before it falls victim to progress. We've traveled and seen a lot and I was not prepared for how this place would steal my heart. Go now if you can because the clock is ticking. It won't be this way 5 years from now. Selba, welcome to One Perfect Bite. I hope you'll come back often. I love sticky rice, but learned something with your post today. Now, I'm wondering just where I could find one of these for cooking rice 'the traditional way'. Have a super Wednesday Mary. Welcome Back! Great post, and am looking forward to hearing more stories (and seeing photos) from your travels. Julia, it's good to be back. My time clock is not yet back to normal but this can't last forever - right? Beautiful writing, Mary. "their safron threads", what a beautiful description of their clothes. I so enjoyed reading and learning. Susan, thank you for your kind words. What a beautiful and moving ritual of giving and receiving. Welcome home, Mary. I missed you. This is a wonderful post and the photos are gorgeous! I love your stories Mary. Your words are charming, calming, and interesting! And your food is always outstanding! That's really neat! What a cool recipe + story! What a great post. I love learning about different cultures. This is a really interesting post. I've actually never made sticky rice before. Your pictures are great. Love sticky rice, thank you for the recipe!! How wonderful to see the pictures, what a treat, they are absolutely beautiful! It sounds like you had a wonderful time! Your trip sounds so interesting! I just met a man from Laos who told me about his preference for eating rice at every meal. Learning there. Sharing here. Food tells so many universal stories. Lisa, the Lao preference for rice is remarkable. They put sticky rice to soak before going to sleep for the night. They steam that rice in the morning for breakfast. Before they leave for work or move on to other chores, they set the dinner rice to soak. The preference for rice is apparent throughout southeast Asia. It is an inexpensive food readily available (now) for the people. Mary : Oh this looks so lively can't wait to try. We love sticky rice. Great Pictures. One of our friends is Laotian and sticky rice is always served for dinner. She makes the best egg rolls and summer rolls! Sticky rice was the predominant starch served in our house. I remember when I was a kid, Thai restaurants weren't serving it or Isaan food in general. There was a sense of it being hillbilly type of food. Now there's an explosion of it everywhere. It makes me very happy to see. Darlene, this whole experience was one of the highlights of my life. Oh, I eat with hands too when opportunity allows me ... right hand though :-D I always asked my mom, how a person eats with right hand If he lost his right hand or handicapped with no hands due to misfortunes or from birth? Also... the women are not allowed to touch the monks' bowls when they put the food in (also any contact with the monks' body) so, I'd seen some women used tongs or chopsticks to pick the food into the bowls. Pixen, it is an honor to have you visit my site. You have a very beautiful country. I will be writing about it in the next few weeks. Thank you for the information regarding the monks. 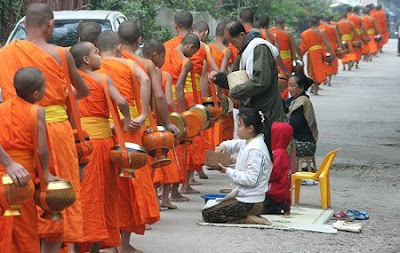 In Laos the women may not touch the monks but they may drop rice into the alms baskets or place an offering on a mat that the monk will pull towards himself. I will not be able to see the Kathina ceremony but a new friend has promised to photograph it for me. I do hope you will come back. I also hope your Mom has a sense of humor. Love your pics, Mom & love sticky rice - yum!